In this age of accountability, researchers increasingly must place themselves squarely in the media spotlight. For many, it's not such a comfortable place to be. Warren Moos is a professor of physics and astronomy at Hopkins who wants to know how the universe was formed. He has assembled a team of scientists to build a satellite that may give him the answer. Finding out why we're all here is no small matter--but that's not why I phoned him last year. Why, I wanted to know, was he studying how to talk to reporters? "Oh, you want to talk about charm school," he quipped. Learning how to talk to journalists isn't at the top of his favorite things to do list. But in case he does find out why we're all here--or even if he doesn't--the university wants him to learn some tricks of the media trade. Addressing members of the press is something like doing the tango--there are several right ways but many more wrong ones. Such as: Don't drink soda before you give a radio interview. The audience will hear you burp. During a television interview, don't fold your arms across your chest. People will think you're not speaking the truth. Don't stand with your hands cupped in the "fig leaf position," as though you're in a soccer team's defensive lineup. Avoid jargon. And for heaven's sake, don't give the long-winded history of your project; start with the punchline. These were the kinds of pointers that Moos and his colleagues learned last fall, at a workshop led by Randy Minkoff and Sue Castorino, the traveling husband/wife consultants known as "The Speaking Specialists." In the months that followed that initial workshop, Moos and his team continued learning what--and what not--to say to reporters about the Far Ultraviolet Spectroscopic Explorer (FUSE), the satellite they were building. The scientists faced a variety of daunting challenges. One was finding a way to explain the arcane science of a complex instrument simply and accurately. As Moos says, "I've got to bring it down to the newspaper ninth-grade or sixth-grade level and I'm not good at that." Another major challenge would be getting people excited about results they have to imagine rather than see in a photograph. Unlike the Hubble Space Telescope, which contains a camera that takes visible light pictures of the sky, FUSE records spectra. Translation: graphs showing the chemical constituents of the object being examined. Astronomers love spectra. They can learn a tremendous amount from the random-looking patterns of lines. But from a PR point of view, spectra are about as exciting as picket fences. If the scientists wanted publicity, they would have to figure out a way to make their project captivating. Fortunately, noted consultants Minkoff and Castorino, the team had some tantalizing hooks to dangle: FUSE's discoveries, the astronomers could say without exaggeration, would provide a raft of information about the first minutes following the Big Bang. In addition, it would mark the first time a university had been given such responsibility for building and operating a satellite; even its mission control would be based at Hopkins. What's more, Moos and company could play up the "big savings" angle. Originally, NASA was going to build the satellite, at a budgeted cost of $350 million; when Congress subsequently squeezed NASA's budget in the early 1990s, FUSE looked like a goner, until the Hopkins scientists stepped in with the promise to build and manage the satellite for just $108 million--a promise they ultimately delivered on. Despite the best reassurances of Minkoff and Castorino, Moos and the other Hopkins scientists were more than a little wary as they embarked on their media training odyssey. Their uneasiness is shared by many in the research and academic communities, even Nobel laureates. As Nobel Prize winner Jonas Salk once said, "When a reporter approaches, I generally find myself wishing for a martini." THE PROBLEM MAY BE ROOTED IN the fact that journalists and academics come from two different cultures, each with its own language and communication styles. "Scholars are often dealing with complex research projects, multifaceted interpretations of research data, the relevance of which is not always apparent or relatively easy to explain in one simple sentence," comments Pier Massimo Forni, Hopkins professor of Italian literature and culture. "The interviewer, on the other hand, is constantly looking for that one simple sentence that will do the work for him." Adds Joann Rodgers, deputy director of communications and public affairs at the Johns Hopkins Medical Institutions, "People go into academic life because the skills they are interested in developing are analytical. It makes it hard for them to say, 'This is right. This is wrong.' They see millions of shades of gray in every issue. They don't rush to judgment." Bridging this gap between the cultures of academia and journalism are the media relations and public affairs professionals. Throughout Hopkins, the public affairs enterprise has grown considerably in the past decade, as research funding has increasingly become predicated upon researchers' accountability and public outreach. Today, each Hopkins campus has its own media relations staff--men and women whose job it is to pitch stories about their faculty and staff to reporters across town and around the globe. As a result of such efforts, Hopkins people and their work make headlines in many venues every day, from The New York Times to National Public Radio to the Utica Observer-Dispatch. At Homewood, the Office of Communications and Public Affairs handles 250 telephone calls and Internet inquiries from reporters each month. These inquries run the gamut, from, "I'm doing a story about Russia and need an expert on Russian art," to "Could you get someone from your economics department to comment upon yesterday's plunge in the Dow Jones?" At the Oncology Center, public affairs reps receive 40 to 50 calls per month, more if a celebrity--such as Orioles outfielder Eric Davis--is being treated by center physicians. It is the job of the public affairs specialist to help academics weed out the academese and jargon and craft simple, intriguing explanations of their work. Some academics worry that talking to reporters will compromise their professional standing, as though branding them with a red letter "P" for popularizer. Others fear that important nuances of their work will be lost. Media affairs folks also spend a good portion of their time addressing faculty's fears about speaking to the press. Some academics worry that talking to reporters will compromise their professional standing in the eyes of their colleagues, as though branding them with a red letter "P" for "popularizer." Others fear that the important nuances of their work will be lost, that what is gray will be made black and white, or worse. At the Oncology Center, "the biggest fear of our faculty is that their findings will be overhyped," says Karin Twilde, associate director of public affairs. Medical oncologist Nancy Davidson says her patients regularly bring her newspaper or magazine stories about breakthroughs in cancer treatment. They believe that the new drug or therapy will be the thing that will help them overcome their disease. "By nature those [stories] are going to be superficial," says Davidson, and miss the all-important reality: drug treatments generally take years, if not decades, before they are ready for clinical trials. Even then, they may never be shown to be effective and moved to pharmacy shelves. There's also the fear that reporters will zero in on a controversial aspect of a faculty member's work, and miss the main point. Take the experience a few years back of William Dooley, director of the Johns Hopkins Breast Center. At the request of Dooley's breast cancer patients, Hopkins had begun offering the option of an outpatient mastectomy. Participants went through an intensive education program and always had the option of deciding to remain in the hospital following their surgery. But reporters seemed to be after a completely different story, says Dooley. They wanted to establish that HMOs and health insurance companies were pushing such procedures as a way of reducing costs, as appeared to be the case in Connecticut, he says. Dooley told reporters that it was "inappropriate for insurance companies to dictate that every place should do outpatient mastectomies." He also went to great pains to explain that Hopkins's decision was not influenced by insurers' demands. But the resulting print, radio, and TV news stories mainly emphasized the negative side of the issue, Dooley says. Sometimes researchers balk at talking to reporters because they've been burned before and they feel their time is better spent at the lab bench or the patient's bedside. Case in point: Last spring, ABC interviewed and filmed several Hopkins oncology researchers for a special on cancer, Cancer: The Race for a Cure, that aired last June. Filming required many hours of the researchers' time. But when the show aired, several of the segments filmed at Hopkins had ended up on the editing room floor. Incensed, one physician sent the producer an angry letter and a bill for his time. ONE DAY LAST FEBRUARY, five members of the FUSE group sit down with their media team to continue their training. The first concern on everyone's mind today is neither the Big Bang nor spectra. It's John Glenn. The former astronaut and senator is scheduled to make his 35th anniversary return to space in October 1998, the same month FUSE will be launched into space. Publicity surrounding Glenn's mission will surely eclipse the Hopkins satellite. Glenn is a national hero, an icon. FUSE is, well, a satellite that would take, er, um, spectra. Furthermore, the FUSE scientists are concerned they may be asked tough questions about the scientific merits of Glenn's mission, since critics have argued that NASA should not devote resources to a mission they view as celebrating heroism more than furthering science. Leading this meeting are consultants Minkoff and Castorino, who are former veteran news reporters, and Steve Libowitz, Homewood's director of News and Information. Minkoff, a voluble speaker who still has the slightly rumpled look of a daily news reporter, suggests that the scientists gracefully sidestep all questions about Glenn and try to return the focus to FUSE. Suppose a reporter asks whether NASA is justified in spending billions of dollars sending satellites into space, while on Earth there are myriad social problems requiring funding. How should the scientists respond? Minkoff asks the team. Astronomer Bill Blair is a planning scientist for FUSE and one of the project's two press liaison officers. He takes a stab: "In a well-balanced society, there has got to be room for everything-- exploring space as well as battling social ills." But Minkoff shakes his head and suggests a safer route: "I would have said, 'It's really not up to me. I'm a scientist. I don't decide the budget.' That way you're deflecting it." Moos, it turns out, is especially apprehensive about NASA-related questions based on his previous experience. In 1990, he was a co-investigator for the Hopkins Ultraviolet Telescope. HUT was flown aboard the space shuttle, and during its flight, its automatic pointing system failed. After several days of troubleshooting, HUT's ground team figured out a way to point the telescope manually. In the end, HUT carried out 40 hours of observations, and, together with the other scientific instruments on board, provided some of the most prolific scientific results of any shuttle mission. To Moos, this story was about a heroic effort on the part of hundreds of scientists and technicians who had valiantly conquered a problem that could have jeapordized HUT's observation ability. "It was fantastic, out of The Right Stuff," he says. "In the aftermath of Hubble," says Physics and Astronomy's Warren Moos, "the pack was into beating up NASA. They have a different agenda and different needs. They've got to sell newspapers and TV time." But the press did not want to hear about their success. Headlines trumpeted the pointing system's failure. One day shortly after HUT had completed its observations, Moos and other colleagues at HUT's science operations center were breathing a sigh of relief and getting ready to celebrate. Then the phone rang. It was a reporter from a major newspaper who asked Moos, "Would you say that this mission was a major failure?" "In the aftermath of Hubble," says Moos, "the pack was into beating up NASA. They have a different agenda and different needs. They've got to sell newspapers and TV time." Exactly right, says the Medical Institutions' Rodgers, author of the Media Guide for Academics (The Foundation for American Communications, 1994). But that doesn't mean that "agenda" is always sinister or combative, she says. It's often simply an inkling of what to look for, akin to the "hypothesis" of science. While reporters's questions may appear to suggest a bias, Rodgers says, reporters often use them to test a hypothesis, like sending up trial balloons. Of course, if a journalist's sleuthing reveals that her agenda is wrong, she should change the thesis to comport with the facts, just as a scientist should change a hypothesis when research does not bear it out. That doesn't always happen, Rodgers admits. 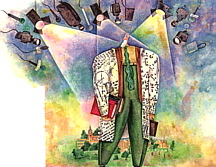 Many media specialists advise researchers to come up with their own agenda before walking into an interview or press conference. Be armed with two or three points you want to get across, they counsel, and keep returning to those points during the interview. WITH ALL THE POTENTIAL HEADACHES and pitfalls that come with speaking to reporters, why would any academic bother? There are faculty throughout the university who will flat-out refuse to talk to the media. Increasingly, however, that stance is becoming less common, says Rodgers. She's found that more faculty are interested in, if not desirous of, discussing in a public arena what they do. "I've seen a real shift in this," she says. "There is a great deal of talk in academic circles of 'accountability.'" While there have always been researchers who were willing and eager to explain to the public what they do, says Rodgers, "this understanding has become more of an expectation in recent years." Funding agencies, perhaps especially in the sciences and medicine, have definitely contributed to this change. The National Institutes of Health, NASA, and other agencies are increasingly requiring that grant recipients do more public outreach to explain to taxpayers how their money is being used. (The NASA-funded FUSE project includes a sizable public outreach component.) Even when such instructions aren't explicit, savvy researchers are realizing how crucial it is to generate public support for their work. When funding dollars are sparse, money tends to flow to more popular causes. What's more, today's 30- and 40-something faculty members are more media-wise than their predecessors, having grown up surrounded by television, radio, and, now, the Internet. Through personal Web pages, many now also gain firsthand experience in disseminating their own news. "Though I can't document it, I think they're more comfortable with the tools of communication," says Rodgers. That doesn't mean they are born communicators, however. Many researchers are more at home in front of the computer monitor than before the lights of the camera. Though they are driven by an abiding passion for their work, they find it difficult to evoke that excitement to outsiders, Rodgers has found. For several years, she taught a short course at the School of Public Health that included lessons on journalism. In one exercise, Rodgers asked students to imagine that a Martian had just landed on their doorstep. The students were then to write a description of baseball for the Martian, without using any jargon. After teaching the exercise for several years, Rodgers knew the sort of responses she would receive: One person throws a spherical object. Another person tries to hit the object with a wooden stick approximately three feet long, and then runs to a spot on the ground exactly X feet away. The students, says Rodgers, neglected a fundamental tool of journalism. "Not one single one of those [students] ever said, 'Baseball is fun,'" sighs Rodgers. "There was no sense of what the game is." So she would use the exercise to show students that journalism, as opposed to, say, grant writing, relies upon emotion to convey an idea. Reporters are drawn to such emotion. Joe Palca, science correspondent for National Public Radio, says that his most effective interview subjects are those who can make their work personal. "While I try to get the facts, I also want to tell about people. It's easier for people to listen to stories where the individuals are not so remote. If I can make it a 'Once upon a time' story, I'm on a narrative roll," says Palca, who is also president-elect of the 1,700-member National Association of Science Writers. Says Joanne Silberner '77, NPR's health policy correspondent, "We love simile and metaphor." It's like giving glasses to the sight-impaired. In Silberner's experience, the sources who dodge questions or offer only canned responses have often received some form of media training. "I can usually tell when people have been coached," she says. "I spend the rest of the interview trying to get around the media coaching to try to get the story." While media training can be useful in helping interviewees to form more cogent statements, she says, there may be a point when they become too polished. ZOOM AHEAD TO THIS PAST AUGUST. FUSE team members are in a conference room at Homewood's Bloomberg Center for Physics and Astronomy, practicing their lines for a press conference that will take place in a few days. Moos starts off: "FUSE is 18 feet long," he says, haltingly. "It's a reasonably large satellite. It will be just under a 500-mile orbit. . ."
Libowitz, who watches the mock proceedings from a corner of the room, looks uncomfortable. "That's good, but what you're missing is the goal of FUSE," he says. "You jumped into 'FUSE is 18 feet long.' Remember: You, Warren, are the gee-whizness, you're the hook. Don't think of this as an academic conference." All of a sudden, Moos seems to understand. "I need to rewrite my speech to be less of a classroom speech and more news-oriented," he says, looking anxious. The press briefing the scientists are rehearsing for had originally been scheduled to occur five months earlier, in April. That was when FUSE's mission control center opened in the basement of Bloomberg. The plan had been to invite Maryland Senators Barbara Mikulski and Paul Sarbanes to speak at the opening ceremony and press briefing. But then NASA postponed the launch of FUSE--from October 1998 until mid-February 1999 at the earliest. The press briefing would have to be pushed ahead; April was just too early. Searching for another angle to generate interest among reporters, Libowitz decided on an August briefing--it would coincide with the shipment of the completed satellite from Hopkins's Applied Physics Laboratory, where it was built, to the Goddard Space Flight Center, in Greenbelt, Maryland, where it would undergo environmental testing. This did not have as much oomph as two senators dedicating a mission control center, but it would have to do. But then, another wrinkle: several key FUSE players would be on summer vacation the day FUSE was scheduled to be shipped. So, in the end, the press briefing would have to be held two weeks after shipment of the satellite. Over the summer, Libowitz and his staff sent out 278 announcements of the briefing to science and general reporters throughout North America. He also telephoned a few key local reporters--from The Sun and Washington Post--to remind them of the date. Libowitz expects a slim showing. It's vacation month, after all, and the launch of FUSE is still several months away. ON THE DAY OF THE PRESS CONFERENCE, Moos and Blair arrive wearing jackets and ties and looking remarkably calm. Several other FUSE team members are on the panel, and a few NASA collaborators are there as well. Would the reporters roar their terrible roars and gnash their terrible teeth? The high-domed room on the top floor of Bloomberg is full-- Libowitz wisely has opened the press briefing to all faculty and staff in Physics and Astronomy, and scientists far outnumber reporters. Just three reporters from outside Hopkins attend. Rather than thundering monsters, they are a relatively tame bunch: A friendly reporter from WBAL radio, a rather serious Sun science reporter; and an eager young man from the Baltimore Business Journal. Moos starts off: "Good morning, thank you for coming. What I'm going to do today is share our excitement with you. We've developed a new tool of astronomy--FUSE--it has been delivered to Goddard for testing. The launch will be in February. "Astronomers have been waiting for almost two decades to answer questions about the Big Bang. . ."
Moos's speech is light-years better than the one he gave at the practice run. He reels off far fewer pieces of data and talks more enthusiastically about exploring space. The briefing continues relatively smoothly. In the question-and-answer session at the end, as Libowitz had predicted, reporters ask how the team cut the FUSE budget, but none of the queries is unexpected or particularly menacing. Afterward, as planned, the reporters are invited to tour mission control and have lunch with the team. Only the Baltimore Business Journal reporter accepts the invitation. HOW DOES THE FUSE STORY PLAY in Peoria? The Baltimore Business Journal runs a two-column story several days after the press briefing. In it, reporter William Glanz leads with the fact that FUSE pumps $96 million into Maryland's economy. Three weeks after the briefing, The Sun publishes a story by Frank Roylance, who highlights the policy change angle--NASA is shifting away from big, expensive missions toward smaller, cheaper projects built and operated by universities, and Hopkins is a pioneer in this new approach. The Sun story is also apparently sent out on the wires: That day, Libowitz receives a call from a Brazilian television reporter who read the story and wants to follow up. FUSE is also briefly mentioned on two local news programs. A deluge of coverage it is not. But Moos is not discouraged. He is pleased with the "integrative nature" of the reporting in The Sun story. The coverage was great for Hopkins. Besides, he says, "I think Libowitz planned this press conference as a dry-run," for the team to try out lines and gain practice in speaking to reporters before the crunch of launch time. With luck, all the preparation will be worth it. The group will get another chance to speak about the project at a NASA-sponsored press conference closer to the February launch. And the team can also expect to get more media exposure once FUSE generates findings. Bigger things, they hope, are yet to come. At least, says Moos, "now I have my script in the word processor." Melissa Hendricks is the magazine's senior science writer.